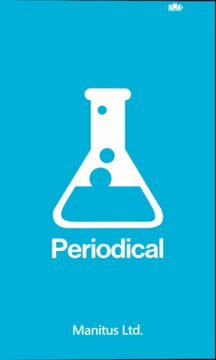 A great FREE periodic table of elements reference application. 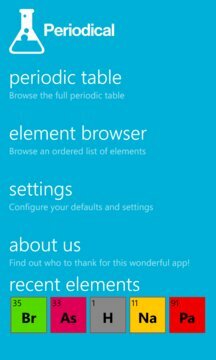 Browse the periodic table in portrait or lanscape mode, flick through a custom sorted list of all the elements. Colour keys help identify element types. Thank you all for the great feedback and comments. Thanks to the great guys at Toledo2.com and Nokia the app has had a visual overhaul to make it feel a bit better. I have also removed the ads to improve the user experience. Thank you to SteveB for spotting a couple of errors in the last version. Specifically a conversion error in the Celsius to Fahrenheit converter. Not sure how that happened. All fixed now! * Stability improvement, the application no longer crashes after selecting an item from the element browser. * Fixed the issue where the elements list would be blank after making the first selection. * Thank you for all the feedback. Corrected the Kevin scale issue and tried to make it clearer between panning and selecting.